For many expats living in Japan, one thing about the country that continues to be somewhat irksome is its stubborn attachment to cash. Most of us are not used to carrying cash around, and especially not when a good chunk of it is coins. That’s why a lot of people are probably going to like a new cashless payment system called PayPay, which is now available to smartphone users in Japan. The name “PayPay” may remind you of Paypal, and, in some cases, they’re similar; like Paypal, PayPay is something of a web-based banking system. However, where Paypal functions like a bank, PayPay is much more like a prepaid card. There are no fees to join, no fees to pay with PayPay, and no minimum balance required, and all you have to do to join is put in your phone number, a password, and a pass code that they send you via text. Then, simply “charge up” your account, or even attach your Yahoo! Money account or a credit card to your PayPay, and you’re free to use it wherever it is accepted. And though PayPay is still relatively new, it’s already an acceptable payment option at more than 100 shops, restaurants, bars, and even hotels, including convenience stores like FamilyMart and Mini Stop. You can tell which shops accept PayPay because they have PayPay’s trademark red “P” near the register. You can also check the list on the app or on their official website. PayPay always seems to be getting new affiliates, so it’s worth keeping an eye on. Payment using PayPay is easily done in one of two ways. One allows you to scan a QR code at the register, input your total bill amount, and show the confirmation to the associate. The other brings up a barcode on your app, which the register can scan and process into a payment automatically. PayPay appears to have plenty of benefits for its users as well. As a basic perk for being a PayPay member, for every purchase made using PayPay, the user gets 0.5 percent back. It’s not much, but if you end up using your PayPay account often, you might build up a small chunk of change, up to 5,000 yen per month. New users will also automatically get 500 yen added to their account, and the first time you add money to your PayPay you will also get 1,000 yen free. Finally, depending on your cellphone provider, you might even be able to get an additional gift of 500 yen! 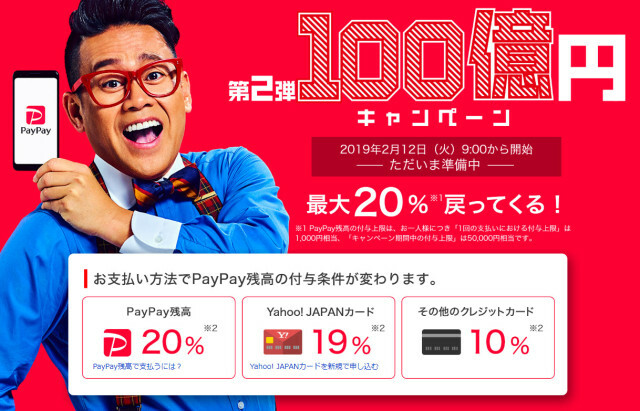 Right now, however, PayPay is offering a special campaign, whereby users get 20 percent, or up to 1,000 yen, back for each purchase made with PayPay. At the same time, they’re also holding a special lottery campaign, where one in every 10 purchases made with PayPay could earn you 1,000 yen cash back. If you’re also a member of Yahoo! Premium, the possibility doubles to one in five. PayPay is not currently available in overseas app stores and does not have English-language accessibility at the moment, but if you’re living in Japan and have a way to read and translate Japanese, this might be a great system to try out. That way you won’t always have to keep cash or even credit cards on hand, which could help protect you against identity theft! Read more stories from SoraNews214. What is not good about the cashless society is that big companies, banks and credit card companies and so on take a commission on everything bought without cash. The retailer has to pay this commission to the company and that commission is passed on to you in the form of higher prices. Paying cash rather than cashlessly will help small shops and so on stay in business. The "convenience" they are selling us is not free. They skim a bit off of each purchase, and they harvest all of our data. The more data points, the more valuable it is (for them). Too many competing services makes it a hassle for any one individual to commit to any one service, as it's likely that it won't be available at many of the retailers you frequent. There comes a point where signing up for and juggling multiple cashless apps moots the convenience factor. I'll just keep using cash (accepted everywhere!) and my Suica card. I like the way japan is a cash society, hope it stays that way while im still kicking. Paypay has been out for awhile now and did their first 20% back campaign with a much higher limit. I guess after getting their rebate everyone stopped using the app so they have to bribe people again but with much smaller amounts, which makes more sense since it encourages people to use it for more frequent smaller purchases. Well, if they want to throw around money like that in a desperate attempt to get market share then good luck. Either way it's not like Japan is a stranger to cashless apps, there are so many now. Line Pay, Rakuten Pay, Origami Pay, upcoming Familymart Pay, too many of the damn things which all do the same thing. I’m thinking the credit card info leak and the hassles caused by that also caused people to stop using the app. The cashless society begins. Downard spiral to Oblivion. Hm. Like point cards. I have many..too many. Anyway, I have already PP on my iPhone. I forgot, how do you charge it? I'm with you on that one, put all my coin through the local Food Mart till, and Pasmo, for vending,trains and ebikes, and topped up at stations, but as you say if you let the market decide, it proliferates to the point of silliness. Japan need visa paywave so you can pay with applepay or Samsung pay anywhere.